Another Long Walk: Oh, Canada! Oh, Canada! Woke up to rain... look at that water running down the trail! 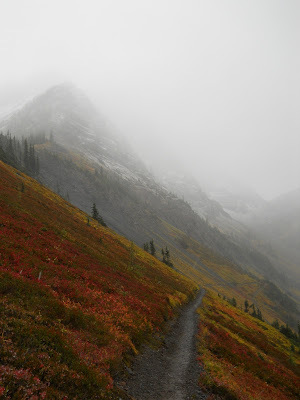 The trail climbed towards Woody Pass, and the rain turned to snow. SNOW!? 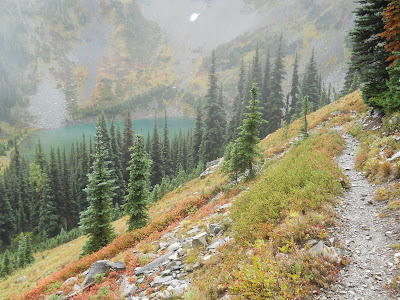 I had a few choice words for the PCT, but I really shouldn't say them on this blog. =) I had to trudge through a lot of snow in the High Sierras, but it never dared to actively snow on me. I wasn't terribly concerned about the snow. Snow had not been in the forecast, and I doubted it would accumulate much. Route-finding without a map was not my idea of fun, but I didn't expect it to come to that. It's just the principle of the matter. I felt like the PCT was just trying to rub me out, adding insult to injury. The trail hated me. I just knew it. It wanted me to get off. I agreed--I wanted to get off the trail too. 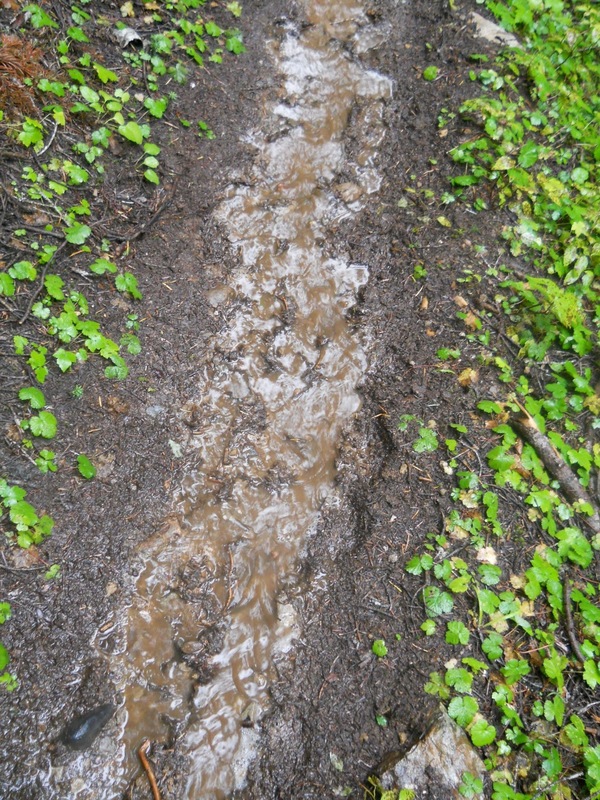 Here's a close-up of that trail. Wet and muddy! I knew Hui wasn't far ahead because I started seeing his footprints in the snow. I assumed it was his footprints, at least. He was the only person who was hiking northbound who had passed me recently. The Graduate was up the trail somewhere, but I expected him to be much further ahead than I was. The Graduate planned to finish at Manning Park today. Hui had passed me the day before. Yep, it had to be his footprints. Nobody else was around to have left them. Most of the day, I was trying to decide if I would actually hike all the way to the Canadian border today or not. I could set up camp at the Canadian border if I had to. I'd seen photos of the border before, and I could camp there. The data points from the page Walrus gave me showed an official campsite less than a quarter mile away on the Canadian side of the border I could also use. But I was also a little bothered at the thought of reaching the Canadian border, officially completing the trail, and still being stuck on the trail for another night! Damn it, when I reached the Canadian border, I was done! I should be off the trail and indoors where it was warm and dry that same night! But there weren't any campsites listed as being near the border on the US side. Late in the afternoon, I finally decided to make a run for the border, and use the campsite on the Canadian side of the border. 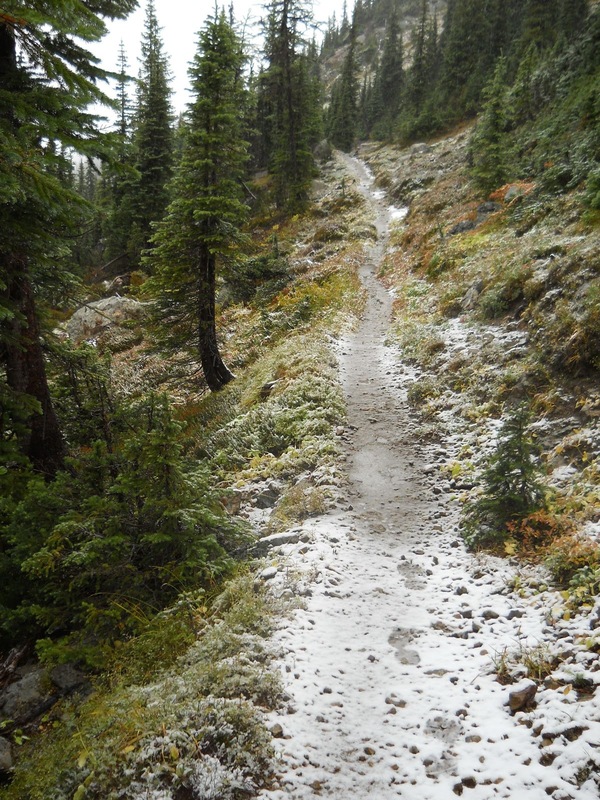 Once the trail descended in elevation again, the snow turned back to a cold, wet rain. It pretty much rained or snowed constantly the entire day. 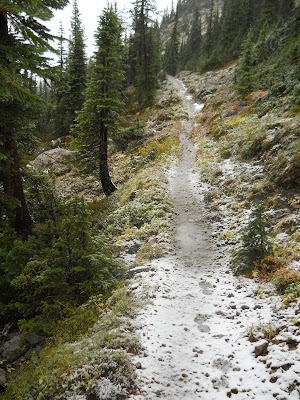 Snow begins to accumulate near Woody Pass. At a couple of trail junctions without markers, I wasn't 100% certain which direction to hike. I tried pulling up the photos of the maps I had taken on my camera, but when I zoomed in, I realized that they were too blurry to read. I studied the junctions, and tried to figure out how it matched up with my blurry photos, and chose a direction. It would take a couple of miles of hiking before I'd reach a landmark on my data sheet to confirm if I went the correct direction or not. If only the snow had fallen this low, I could have followed Hui's footsteps! Drats. 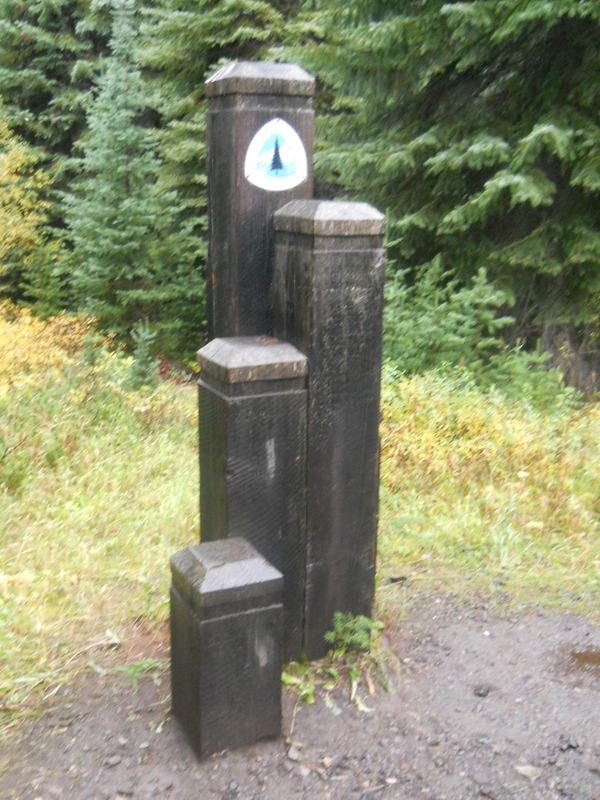 Late in the day, I reached another trail junction with a sign pointing towards the "U.S. Border." "Crap!" I thought. "And all this time, I thought I was hiking to the Canadian border!" I estimated how long it would take me to reach the Canadian border, and expected to reach it at around 5:00 in the afternoon. It was too cold and wet to stop for a break, so I pushed on. Ahead, I looked for that line through the trees marking the Canadian border. 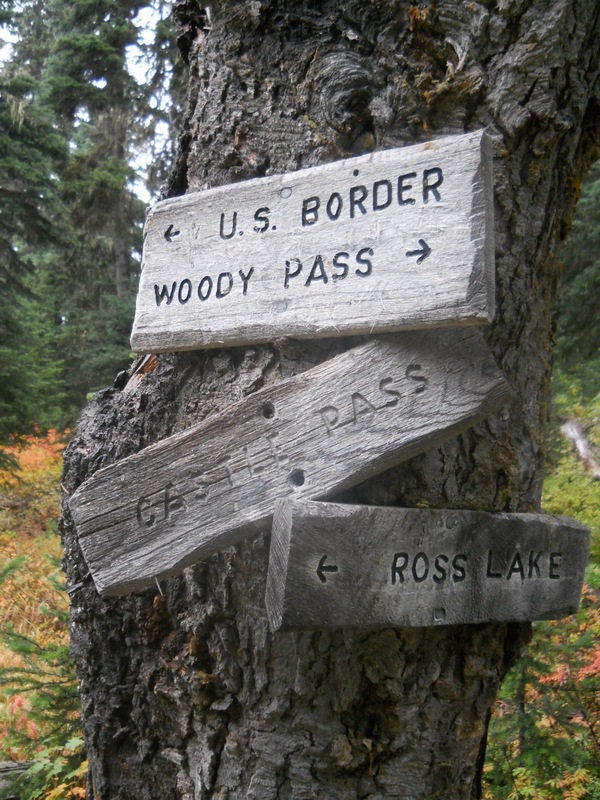 A line of trees had been cut down along the border, marking the boundary of the United States and Canada. I'd seen it in photos and knew it was out there somewhere. I was sure some of the mountains I could occasionally see in the distance was Canada, but I looked for signs of Canada--I looked for that line cut through the mountains, but the fog and rain was so bad, I couldn't see much of anything. If Canada was out there, it was hiding from me. At about 4:30 in the afternoon, I heard a "Whoop! Whoop!" ahead. It sounded like a hiker, whooping it up. Hui? I checked the time, and it was only 4:30. I wouldn't reach the Canadian border for another half hour or so. What's he so excited about? Did he see me through the trees and is trying to get my attention? I picked up my pace a little, to catch up to whoever it was, and found Hui crouched on the ground with his camera, with his umbrella positioned over the camera to keep it from getting wet, pointing it at the monument marking the end of the trail. Whaaat? I was a little disoriented. Why was this monument here and not at the Canadian border? I blame the cold for my slow reaction. I had reached Canada! I made it! Mexico to Canada! I dropped my pack and Hui and I threw an impromptu celebration. It didn't look like I remembered in photos I had seen. The swath cut through the trees was a lot narrower than I had expected. And the photos always seemed warmer and drier than the weather we had today. Those footpints... they must be Hui's, I thought. those prints haven't been there long! Hui had already been at the border for a short while when I arrived and had taken lots of photos of himself with a self-timer. Since Hui was there, though, I didn't bother with a self-timer. I handed over my camera and asked him to take photos of me at the monument. I'm done! I'm done! Well, I still had eight miles to hike out to the nearest trailhead, but the trail was done! We were thru-hikers! I left an uninterrupted trail of footprints from Mexico to Canada! Hui set to work to retrieve the register from Monument 78. 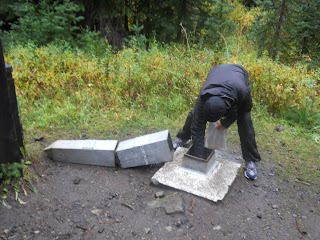 The monument is hollow and the register is inside, so he tried to lift the top, and I started taking photos. He pulled up, hard, saying how heavy it was, and I couldn't help but laugh--it looked like he was trying to vandalize the monument. Like someone knocking over the gravestones in a cemetery. "This is heavy!" he said, straining his voice. "I might need your help here!" Hui took photos of each of the last dozen or two pages of the register--people sometimes write e-mail addresses or contact information, or notes to other hikers behind him. He didn't want to copy it all down, so he just took photos for later reference, then signed the register himself. I noticed that White Beard, Third Monty, and The Graduate had logged in earlier in the day. Danny--who I thought was behind me and I kept hoping would catch up with my maps!--had logged in the day before! Damn! Hui decided to hike out to Manning Park that evening. Eight miles away, he wouldn't get there until well after dark, and we parted ways. I picked up a pen to sign the register, and found my fingers were not working well. I couldn't grip the pen with my fingers--they were so cold and numb. I breathed on them trying to warm them up, but my fingers just weren't working, so I finally gripped the pen in the palm of my hand and wrote something like, "It's a long way to come just to quit, but I quit!" The scrawl looked like something written by a first grader learning their letters. The letters were an inch tall--hesitant and crooked, not following the lines on the paper at all. But it was so darn cold, I just couldn't get my fingers to work. I put the register back in the hole in the ground, then picked up the base of the monument to replace it. $@*%! That thing was heavy! I suddenly had a new appreciation for how difficult it was for Hui to knock the monument over in the first place. I was only trying to pick up half of it and was having trouble. My frozen hands weren't helping matters either, and I had to be careful not to pinch my fingers between the base and the monument. My fingers were so numb, I could probably have pinched one off completely and not even realized it. I finally maneuvered the first piece into place, then set to work on the second piece, getting it into place as well. I needed to get into camp and warm up. I put my pack back on, picked up my umbrella, took one last look around, bade goodbye to the United States, and walked into Canada. 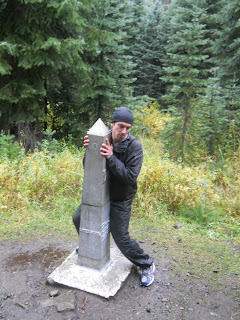 I was hiking to the Canadian border! I reached the campsite about five minutes later, and set up my tarp in a light drizzle. It was already getting quite dark, and I changed into dry clothes, slipped into my sleeping bag, and tried to warm up again. 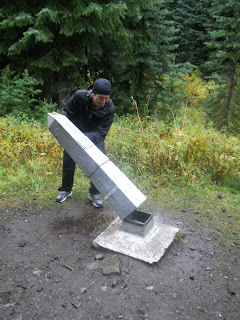 I had been relatively warm while hiking, but during the stop at the Canadian border the cold got into me deep. Tying the necessary knots for my tarp was a huge challenge with my useless fingers, but I finally got it up and slipped into my sleeping bag. I put my hands in my armpits to warm them up, and it must have looked like I was having a seizure because I deliberately shivered large, exaggerated shivers and tensed my muscles to generate more body heat and warm up again. After a half hour or so, I was sufficiently warmed up enough to set about cooking dinner, or my "last supper" as I decided to call it. After dinner, I wrote in my journal for about five minutes--I didn't actually write very much since I was pretty certain this day would stand out in my mind for quite some time--then went to sleep. The trail might be done, but my hike was not. The end of the trail! 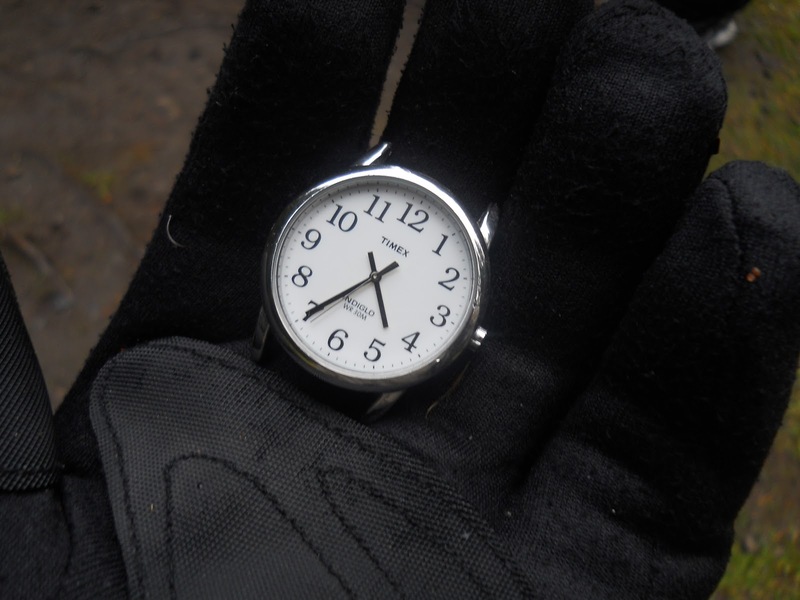 Gotta check the time that I finished the trail! =) About a half hour before I expected! Job well done! I'm going to miss this blog. Good job! Congratulations Ryan! You done it! Celebrate! I will miss this blog. Congratulations! Quite a journey. We'll miss seeing all the fabulous scenery. Thanks for sharing. What's next? Congratulations, a job and blog well done. 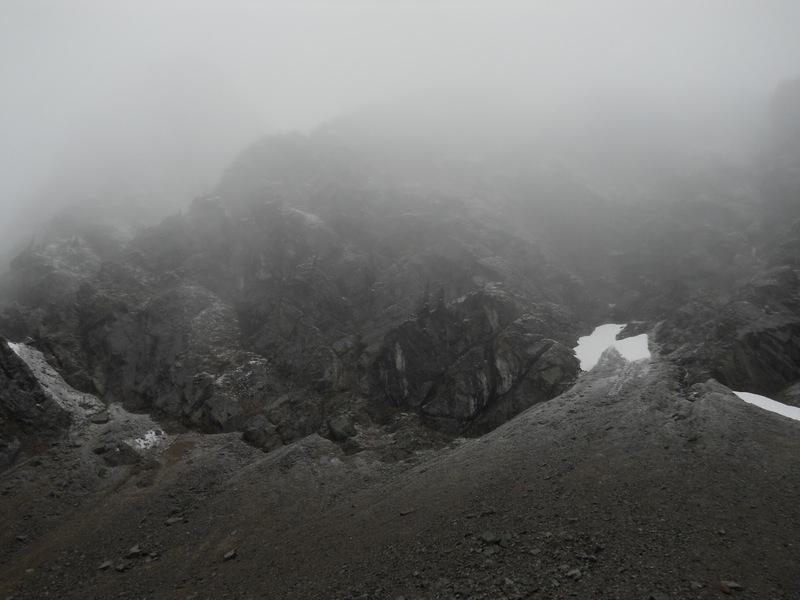 I am surely going to miss your hiking blogs. One of the things I looked forward to every time I signed on. I know I can go back and read some of the beginning. So what endeavor to you have planned now? I am so glad I was able to read about your trip and feel at times I was hiking along with you. I do hope that you put all this together in a book or something someday, I definitely want one! Bravo!!! A whole new respect for you Verde Turtle......an accomplishment only for the brave and the bold. No doubt. Enjoyed your every step! Thank you for sharing and letting us live vicariously through your blog! Well done! One of the best travel narratives I've read - filled with characters, personality and terrific description. A contrary and refreshingly unromantic take on an extraordinary adventure. So sorry it had to end - could you make a U-turn? What the heck am I going to read over breakfast now?? This has been my blog of choice for months. Thanks so much for documenting your journey for all to enjoy. I'll be watching for the conclusion! I loved reading about your adventures on this blog. I'll miss the Green Tortuga! Aw crap, you mean there's MORE? I thought it was over already. Dang. Ryan - Congrats on reaching Canada! I love reading your blogs and at times have said "Yikes, glad it's Ryan and not me!" I can't wait to see the last 8 miles. Going to complete the triple crown next? Great job Ryan. Thank you for sharing your adventure with us. Please tell me there's a hand-carved stamp in Monument 78!! No, there's no stamp in the monument, but there definitely should be! I don't know WHAT I was thinking when I overlooked that fact!!! Was there a note in the book, "Took hand-carved stamp, left keychain."??? Ryan, what an adventure. I felt like I was with you all the way, although 5 months later. And who knew that there was an actual line drawn between the US and Canada! So, I wonder what Canada calls the border if the US calls it the US border? Well technically, your log in was incorrect. 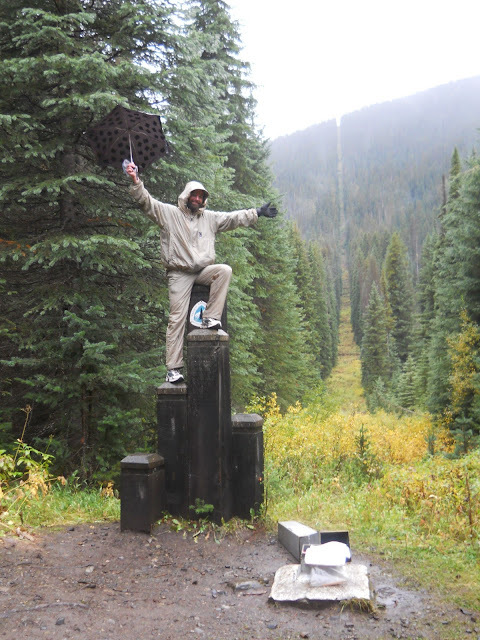 The border isn't the end of the PCT, right? You still had 8 more miles to hike, correct? So, you can't actually quit there....unless a helicopter swoops down to pick you up and take you away. Congrats on reaching the border with another country....your second foreign country in 5 months. I imagine that the last 8 miles of the trail were rather anti-climatic, eh? That photo of you perched on the PCT monument cracks me up. You look like Gene Kelly with the umbrella dancing in the rain! Did you sing, too? Wow.. it's always bummer for me when you get to the end, even 8 miles away from it. I'm one of the silent ones who reads and enjoys every step of your journey. I had no idea about the line cut through the trees.. that's pretty cool. Who knew? I crossed the trail (in my car) in the pouring rain and knew you were somewhere nearby at the time. Couldn't wait to read all about the rain! I had a moment of silence for all you hikers out there slogging through it. How many pairs of shoes did you go through this time? Motor's image is distorted because you have coded it as width="320". I should be 240. "Well technically, your log in was incorrect. 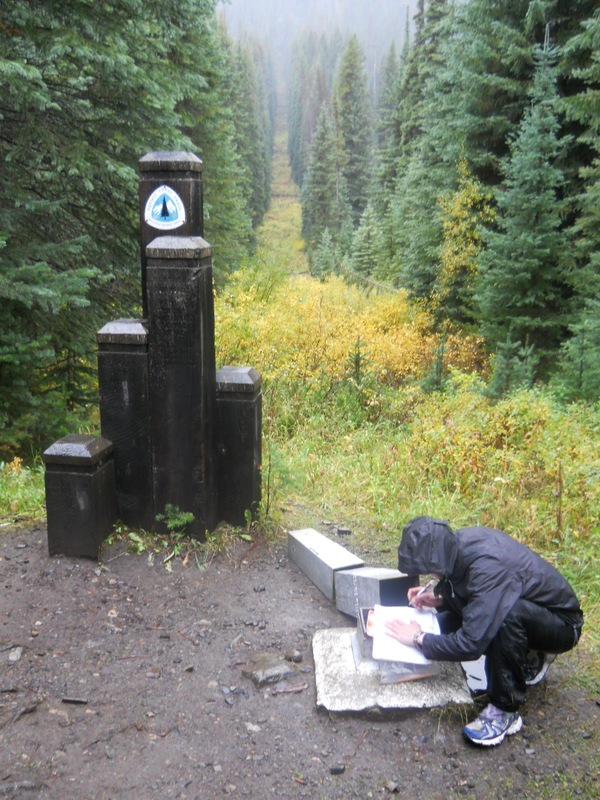 The border isn't the end of the PCT, right?" As I understand it, the PCT ends at the border. 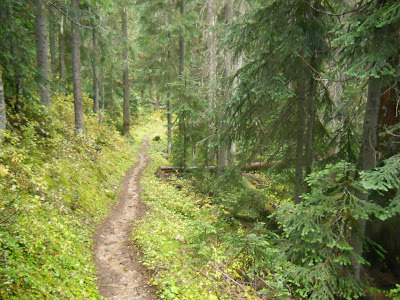 From there it's just a trail to a trailhead in Canada.